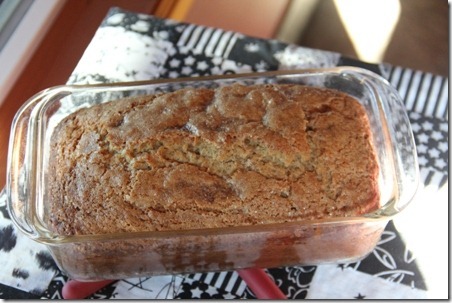 One of my son’s favorite things I make is banana bread. In fact, I’m pretty sure he asks me to buy bananas just so he can leave them on the counter until they turn black. He does actually eat them once in a while, just to throw me off. I’ve developed my own recipe over the years, and have found it works as bread or muffins. It usually doesn’t last long around here, but if you hide a loaf, it’s better the second day. Combine the lemon juice and milk. Set aside. Preheat oven to 350 degrees. Grease bottoms only of 2 loaf pans. Mix sugars and butter in a large bowl. Stir in eggs until well-blended. Add bananas, milk/lemon mixture and vanilla. Beat until smooth. Stir in flour and baking soda until just moistened. Pour into loaf pans. Bake about 45 minutes or until a toothpick inserted in the center comes out clean. Cool. Occasionally, I add a cup of chocolate chips. Sometimes I throw in a little cinnamon. If I’m in a healthier mood, I replace half of the butter with applesauce, yogurt or fat-free sour cream and replace the eggs with egg substitute. I always use skim milk. If you do use something besides butter, the bread is better the first day. To make muffins, pour into greased muffin pan and bake at 400 for about 16 to 20 minutes. The only drawback to this recipe is that you have to plan ahead. Black bananas make better bread than yellow ones. Believe me, we’ve tested that theory more than once.